I recently started helping some friends with their design dilemmas. One of those friends is Tonya, who lives nearby with her husband and three little boys. Tonya has a great antique farmhouse, with amazing floors. But her living room and dining room needed a bit of work. We decided to tackle them together, since they are so open to each other. We started with the living room. Tonya already has great furniture – the couch and two chairs are neutral and comfortable. But she said the room felt dark, as if it were closing in on them. Instead, she wanted it to feel welcoming and cozy. 1. 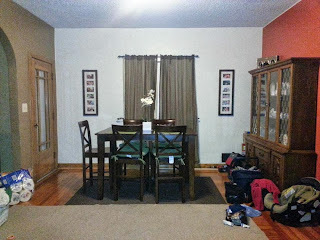 Paint the living room walls a VERY light blue…almost white…and the dining room a medium gray. 2. Paint the trim white. The trim is not original to the house, and she and her husband have decided to tackle this. 3. Put matching curtains on the two big windows in the living room. Possibly these turquoise hospital curtains from The HomeShed, reconfigured to fit. 5. Get a larger run on the floor, and something darker. Right now, the lower half of the room is a sea of neutrals. Tonya is looking into painting a rug she already has, making a rug with fabric, or making a rag rug. 6. Incorporate more lamps and lighting in the living room, including a barn light pendant light, like this one from The HomeShed. 7. Add some curved lines. The furniture is very “straight” and some curved lines will break it up a bit. 8. Accessorize with the colors found in Tonya’s pillow – yellow, aqua, green, brown. Maybe this cute vintage telephone also from The HomeShed? 9. Hang family photos on the barn-board covered windows. 10. Rearrange so that the chairs are in front of the bay window. The dining room, although large, wasn’t really functional. The counter height table was impractical for their young family, and the room really felt like a hodge-podge of furniture. But we came up with a plan to help make the room more cohesive. 1. Paint all the walls a medium gray. Tonya loves the orange wall, but we agree that it’s not the best look with the existing floors. 2. Look for a round table and wooden chairs – matching or mismatched. 4. Paint the china cabinet and add fabric to the windows for more discreet storage. 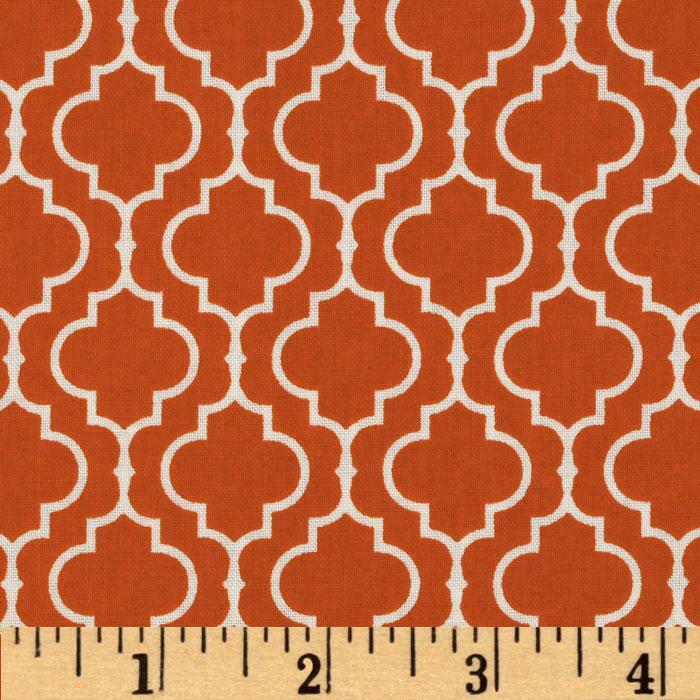 I suggest this fun orange print to bring back that orange Tonya loves. 5. Accessorize with blue mason jars, a colorful lamp, and family photos. I also love the idea of a plate wall like this in the dining room, using these fun plates from Target. Finally, I made a big ol’ pinterest board FULL of inspiration for Tonya’s house. Check it out and be sure to follow me on Pinterest while you’re there! This post is part of 31 Days of Decorating with Junk: Vintage, Antique and Unique for your Home and Garden. 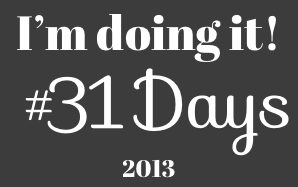 To follow along with 31 Days of Decorating with Junk, enter your email address (top right) or become a fan on Facebook. Hi Katie! Thanks for linking up - I'm glad you did!! Also great to meet you last Saturday - I hope the rest of the day went well!